European Court of Human Rights is an international court, established in 1959, under the Council of Europe and, located in Strasbourg, France. The Court’s judicial language is English and French. 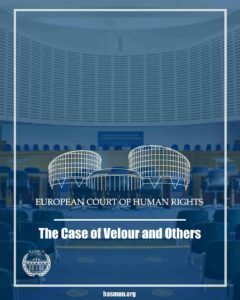 The Court has jurisdiction when a State, who is a part of European Convention on Human Rights, violated the fundamental rights guaranteed by the Convention and its protocols. Individual, communities and legal entities are able to bring cases against countries that have accepted the court’s jurisdiction. To be able to apply; domestic remedies must be exhausted. The application should be made in written format in 4 months, after the final decision is taken as negative by the domestic courts. Applications that do not fulfill the pre-requirements gets rejection. If the pre-requirements are fulfilled, the Court starts substantial examination. Before the examination the court may recommend a settlement. When there is no settlement, If the decision says there is a breach of a fundamental right, the Court enacts a compensation from the State. The case concerned Eli Velour, a baby suffering from a rare and fatal genetic disease. In February 2015, the treating hospital sought a declaration from the domestic courts as to whether it would be lawful to withdraw artificial ventilation and provide Eli with palliative care. Eli’s parents also asked the courts to consider whether it would be in the best interests of their son to undergo experimental treatment in the U.S.A. The domestic courts concluded that it would be lawful for the hospital to withdraw life sustaining treatment because it was likely that Eli would suffer significant harm if his present suffering was prolonged without any realistic prospect of improvement, and the experimental therapy would be of no effective benefit. In the proceedings before the European Court, Eli’s parents argued – on their own behalf and that of their son – under Article 2 (right to life) that the hospital has blocked access to life sustaining treatment (in the U.S.A.) for Eli and under Article 5 (right to liberty and security) that, as a result, he is unlawfully deprived of his liberty. They further alleged under Articles 6 (right to a fair trial) and 8 (right to respect for private and family life) that the domestic court decisions amounted to an unfair and disproportionate interference in their parental rights.